By 2025, a crevasse deep beneath the pacific ocean has broken open, unleashing huge monsters known as Kaijus onto the world. When the destruction becomes too much, equally sized metal fighters, sporting two pilots, are created under the name of Jaegers. Whilst initially effective, the government soon decides to cancel the Jaeger production. However, with Kaijus appearing with an increasing frequency, it's down to the remaining Jaeger pilots to come together and fend not only for themselves, but for the planet. Pacific Rim is not only an incredible film, but also something of a milestone for the action genre. Very few times are we treated to a summer action blockbuster with such a genuine story behind it, layered with complex, emotionally empowered characters. Undeniably, this is a film about giant metal robots punching giant scary monsters. But behind it is much more than I was expecting. In short; Michael Bay eat your heart out. Visually, Pacific Rim is astounding. From the offset we're plunged into a world of rampaging robots and massive monsters, and not once do either look as if they don't belong on screen. The scale of this film is enormous, possibly the largest the action genre has ever seen, and director Guillermo Del Toro never lets you forget it. From using cruise liners as swords to fighting at the bottom of the pacific, we're always made aware how big this film truly is. The set pieces are used incredibly, as well; there is never a dull scene. But, behind all this punching and metal-on-monster violence, most characters are very well developed. Central character Raleigh is given enough motive for his actions, and not once do you doubt this. He could do with a bit more emotion, just to give the final moments a bit more impact, as actor Charlie Hunnam doesn't really tend to do much with his face, but the character himself is strongly built. Eventual co-pilot Mako Mori is essentially and effectively layered with story and emotion, probably the strongest developed character the film offers. And Idris Elba's Stacker also has enough development for us to really feel as if we understand him, even if his actions don't really match his motives. There's also a somewhat touching father-son addition to the characters. The acting isn't as explosive as the battle sequences, but it's a damn sight better than that of most other films of this calibre. However, some characters aren't particularly welcome. Scientists Newton and Hermann come across as more annoying than anything else. When they're apart they become almost bearable, but when on-screen together, they just become aggravating. Why do they need to shout every word they're given? Also, black-market dealer Hannibal Chau is an irrelevantly overused character who overstays his welcome close to five minutes into his first scene. But, overall, Pacific Rim is pretty damn impressive. The scale of the film is enough alone to carry it, so it's a bonus that we're also treated to some mindblowing action sequences, satisfactory character development, an (almost) original story and a surprising amount of both heart and humour (there's a particularly amusing moment involving a Newton's Cradle). There's also a nice set-up for a sequel or two. Whilst usually I don't condone sequels to action films, this could easily become a worthwhile franchise, with enough spark and strength to keep itself head and shoulders above anything else out there like this. And yes, Transformers 2, I'm looking at you. 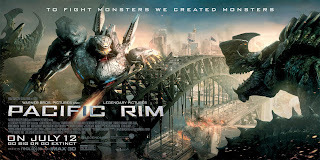 To Summarise: With both scope and scale in abundance, and surprisingly developed characters, "Pacific Rim" is a brilliantly explosive modern action feature.